As some of you will have seen and heard, I had a new sports exhaust developed for my A610 and have been using it on my car for some time now. We have now sold a couple of systems so I just want to put it out there as an option if anyone else is in need of a new exhaust. 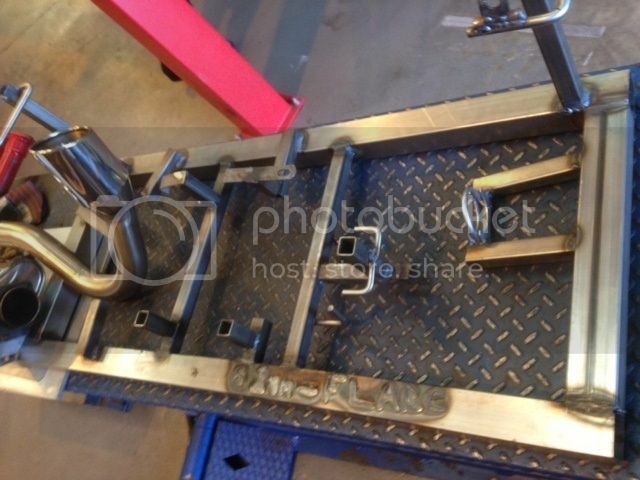 We have made the jig at some cost so we can make systems as and when required as up to now, it has been a case of taking my car apart for the sample. 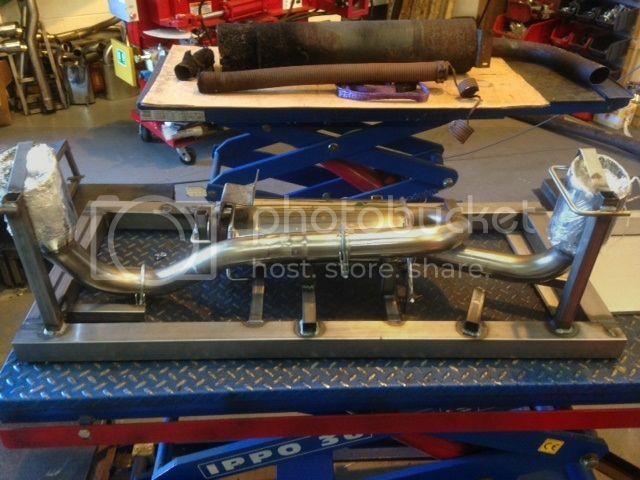 Pictures below show my exhaust (which is 18 months old so not quite as shiny as a brand new one) and the jig. I feel it gives the car a reasonable increase in power and completely transforms the sound of the car. Without sounding 'boy racer', I feel it makes the best of the burble of the V6 engine and makes you want to have the windows open (and is great to listen to in tunnels!). The standard exhaust is very quiet on these as manufacturers have to fulfil all sorts of tests and will generally make a car as quiet as possible and the sports exhaust I had was also a bit lame. I've had Ferrari owners comment how nice the car sounds with the new exhaust. My car is de-cat so will be slightly louder than a car that does have a cat as the cat acts as an additional silencer. The system itself is a T240 polished stainless steel system with mandrel bend pipes and a free flowing transverse silencer (which is about half the size of the original). It comes with a lifetime guarantee for as long as you own the car. It really is a beautifully made system and we can make them with a choice of tailpipes including a slightly larger than standard 76mm round tailpipe, an 86mm tailpipe and the ones on my car which are just under 100mm. The tailpipes can be specified with acoustic internals if you are after a quieter system. We have specially made the brackets and flange so everything comes with the system needed to fit it. You will need to re-use your current olive on the new system. Retail price is £550. I can offer an RAOC member discount of 10% with free postage to the UK (cost delivered £495 which includes the VAT). I can also ship abroad, please mail me for a quote. I (John) can be contacted at mail@pnmengineering.com or 0151 630 6101 or through PM on RAOC for any additional information. New system next to my old stainless sports system. I am interested, "IF" its a through system with NO restriction or scilencers. I had a system made for my GTA that has nothing in the box and it sounds great, even throws flames out if driven hard! I am looking to change my A610's old system for something like I got on the GTA... but can you get more of an oval tail end?? It's about time you posted these up! Cracking looking and sounding exhaust. I prefer the stealth of the original one though so not for me at the moment. Do you want me to push it out to the frenchies? Any sound / video clip? Can you do them for GTA? Last edited by MFaulks on Fri Jun 10, 2016 9:38 pm, edited 1 time in total. Initially, the system was made as a one off as I just wanted to be different and I spend most of my life developing and supplying upgraded parts for other cars (including exhausts). Obviously with something as rare as the 610, it isn't ever going to be a money making exercise as at best there will only ever be half a dozen cars in the UK that may go for one. 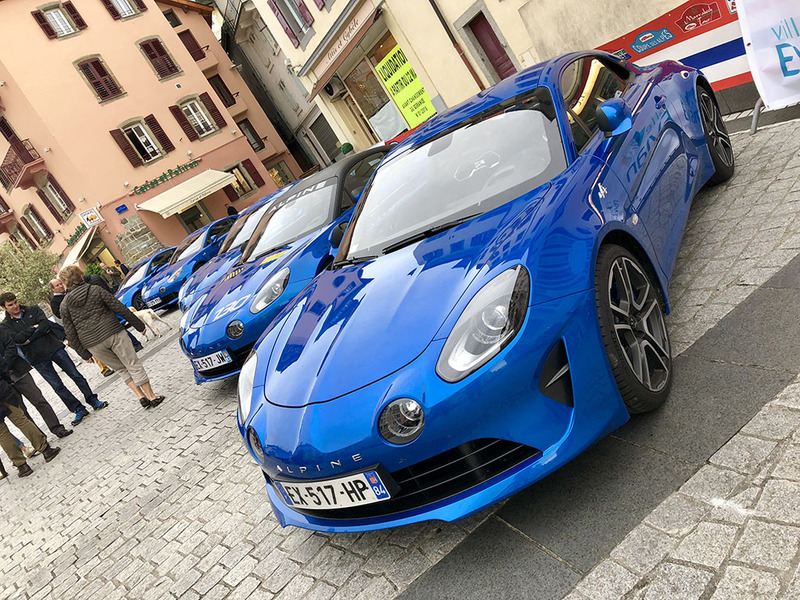 But I did the development and had a number of unique to the Alpine exhaust parts made and I guess it would be rude not to at least offer if others are interested. With this model, there is little choice when it comes to exhausts that I am aware of for an upgraded system and I already had one of the options (maybe the only option?) which didn't quite satisfy my needs for the car. 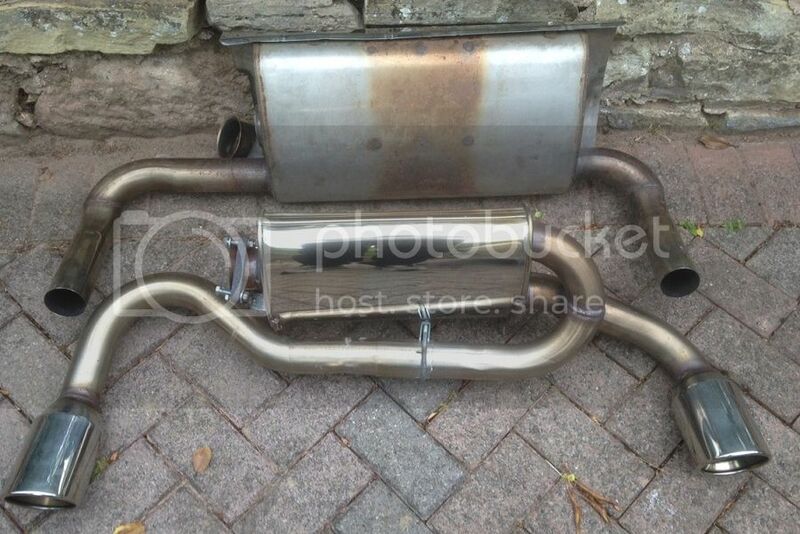 An exhaust could be made for a GTA but the same process would have to be gone through (car would be needed, sample made on car, tested, feedback, make jig, make final system for car and then market). It can be done but I think systems for the GTA are pretty well covered, I have seen a number of different variations and to anyone interested in GTA systems, I would recommend contacting the Specialists for your options. The video clip above is fine, it gives you an idea although you never quite capture the noise properly on a phone camera. And my brother is driving the car (for only the second time) so wasn't really showing what the car is capable of. Vince, I don't see why a straight through or empty silencer system couldn't be made. Pretty much any tailpipe you want can be fitted from standard right up to the rocket launchers. I initially was going to go for the oval ones myself but they didn't have any that fitted in stock. It doesn't mean they can't get them given a bit more time. Regarding supplying to LHD cars, I'm happy to supply anywhere in the world as long as someone can verify that the basic system is the same on both RHD and LHD. I see no reason why it wouldn't be but I also know manufacturers do odd things at times. Well if you can get ovals.. I am in!!! I will measure the ones on my GTA and message you if you want??? I just think the oval is more in keeping to the style of the A610. I agree that the A610 is a fairly quiet car, so I don't mine if it sounds like a Spitfire.. most of the sound goes behind anyway when driving, so I would not think that the sound would become annoying in the cabin.. Thanks for the time you have put into this John... Much appreciated. What have you got on there now, thought you had an aftermarket free flow system fitted? Just thinking out loud Martin I'll probably change the tips on mine as I've never been that happy with the look of it, so just exploring options. This one does sound very nice though. The manufacturers are moving premises at the moment so they are a bit behind with things but I have now got 4 exhausts to make. 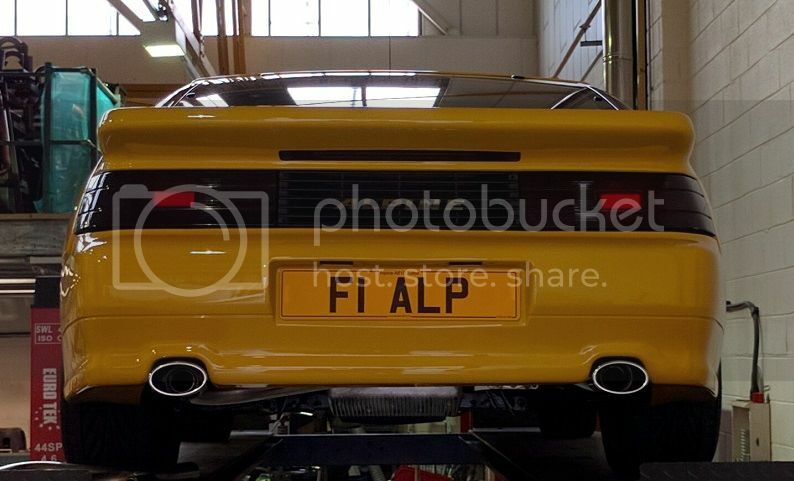 As mentioned in a PM to Vince, I can offer an oval tailpipe similar to the picture of his GTA. Count me in - Oval would be nice ! Spent the day redesigning the system to accommodate the oval tailpipes last week. The system now has a lot more adjustability which wasn't initially needed on my own round tailpipe system. The ovals fit very well in the rear bumper gaps as can be seen in the photo.